The recent first episode of the BBC documentary series “A Very British Renaissance” includes a section describing Nicolaus Kratzer’s contribution to British dialling and the polyhedral dial he constructed for Cardinal Wolseley. The programme also includes an interview with BSS member and dial maker Joanna Migdal. The episode is currently available on the BBC iPlayer; the discussion of Kratzer starts about 20 minutes in. Two Polish physicists, Maciej Zapiór and Lukasz Fajfrowski, took daily photos of the sun from a balcony and captured three separate analemmas over the course of a year. The picture was published on NASA’s APOD site and more information and photos – in English – are available here. Here’s a fascinating and very modern approach to a digital sundial. The creator, Daniel Voshart, built it as a birthday present for his father and its function is limited in both time and location. He has plans to build a giant one next year, though – that will be something to see! This article in the Architectural Digest gives an interesting description of the Buscot Obelisk created by our patron, Sir Mark Lennox-Boyd, to mark the Queen’s Diamond Jubilee. 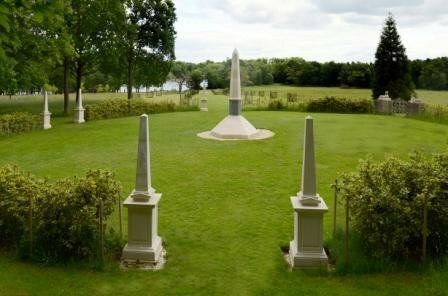 The obelisk forms the focal point of an Egyptian garden at Buscot Park which is open to the public. For details see buscot-park.com. This is a reminder that the most recent BSS Monograph, number 10, is now available. “De Cursu Solis: Medieval Azimuthal Sundials” by Mario Arnaldi covers the development of these dials based on source materials dating from the 10th century onwards. It comprises 58 pages with numerous black & white photographs, diagrams and tables. For more details and to see other BSS publications, please look at our price list. Our Silver Anniversary year has arrived and it is a great tribute to our Founding Fathers and many, many others that we have flourished so mightily since our foundation. The Society has numerous monumental achievements to its credit. In particular, it has created a body of knowledge and expertise exemplified by our Bulletin, our Registers and by the free advice we give to the public.